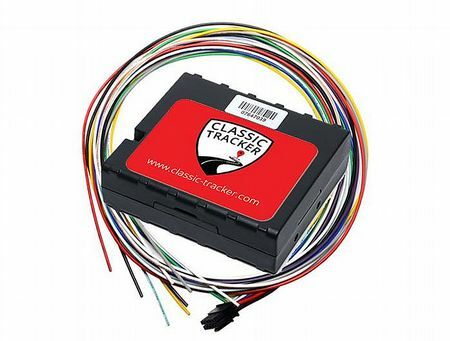 We can not only supply but also fit if required Classic Tracker. When Nick at Classic Tracker told us about his tracking system aimed at the classic vehicle market we knew he was on to something great, and looking at the system, hearing about all the great features and knowing we were heading into Europe over the summer with 6VC, one was soon winging its way down to us to be fitted and trialled. The main unit its self, manufactured in the EU is designed with simplicity in mind in regard to fitting with 3 main connections, permanent supply ground and an ignition feed and your vehicle is now fully trackable, with a forth connection going to a relay that provides the immobilisation of the vehicle, the relay is supplied with the "Safer" package we offer. Using a multi-operator sim connecting by GPS & GSM to establish and maintain a secure connection to the vehicle when either the vehicle is started or the inbuilt sensors detect movement without the vehicles electrical systems being operated, via a built in battery back up system, from pre-determined "SafeZones" triggering an Alert, even unpowered the unit is able to report its whereabouts for many hours. These movements both unwanted and your own trips can be viewed online or via the dedicated App and allow you once logged in to view real time location as well as reports on trips showing routes, distance travelled and speeds along the way, Its through the App or the web portal that if the unthinkable has happened and your vehicle has been unlawfully taken that you can use this information to aid the authorities with location details as well as activating the immobilisation function and bring your vehicle to a standstill. You can if you choose upgrade to Safest which has and additional premium to the price as well as the annual subscription and the good people at Classic Tracker will take care of the police interaction for you. Having Classic Tracker installed in 6VC provided Neil and Sue with great peace of mind for on their Summer Euro Road Trip, knowing that if anything happened while they were away from the car, they had the means to be able to quickly locate it as well as immobilising it if required. We back here at Revington TR also enjoyed following the trip, seeing the days route, distance travelled and speeds along the way, providing our Social Media followers regular updates with screen shots from the dedicated online portal of the trip, something anyone with a Classic Tracker package can look back on, Its a piece of modern technology that integrates nicely with the fabric of a classic vehicle. Product details including pricing on weblink below along with the screenshots of 6VC's Euro Road Trip.